The problem is that your old password is clearly not working for whatever reason. Change it, see if actions work with the new password, and then change it back if you want. And if that does not work?? See if it does first. I just did and now I can't do a darn thing with my scroll and even set my email to where it should go. So what now??? Did you get the email with a link and/or temporary password? No I got something telling me I need to add something to my PC that I never heard of and am not going to put it on my PC. Can you provide a screenshot? (Only provide if there is no identifying information like your email address). I can't on this PC...sorry. 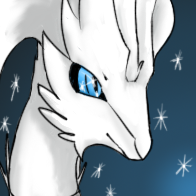 I tried doing them on this PC before and it won't let me make them for some reason. Okay. 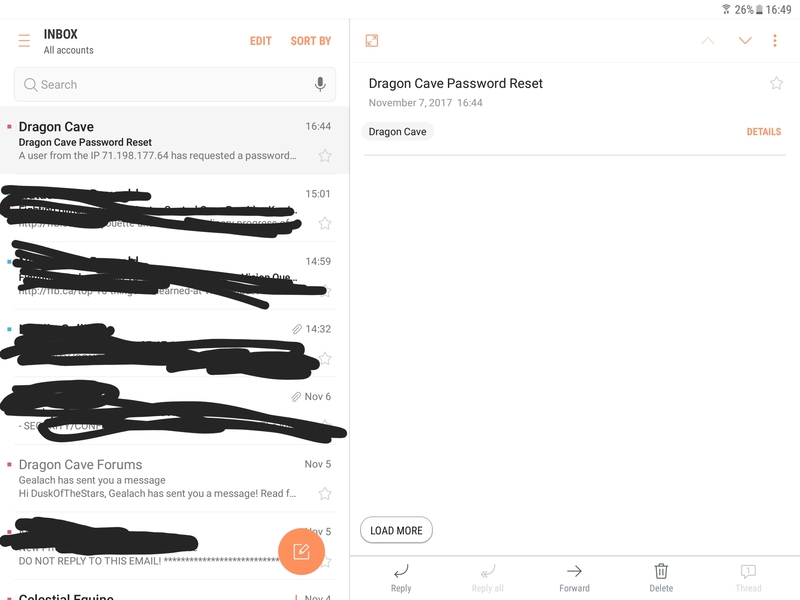 Can you copy/paste the exact text of the email that came from Dragon Cave here? It was never got it from the email it was when I went to forgot my password and tried to change it that way as I was told to do by you. It was never from the email it was when I went to forgot my password and tried to change it that way as I was told to do by you. So you clicked the "Forgot your password?" link and it took you to a new tab that told you that you had to download a program? yep but now I can't get the program thing to show up and I don't want to add something to my PC I don't know about. Definitely do not download anything! Can you copy/paste the message on that page or can you remember exactly what it told you to download? Not now I can't since I can't get that message to even show up now and I can't do a damn thing to my scroll now than I could before. And I would never DL something to my PC I never heard of before anyway. 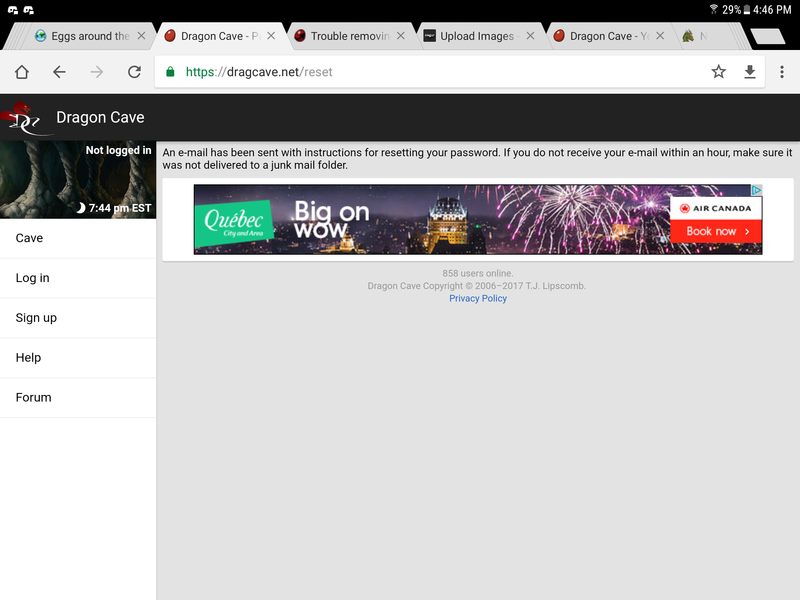 Dragon Cave would not tell you to download something. It's possible your browser is infected and you need to run an antivirus scan. Did you receive an email yet with password reset instructions? Mkay so I tried the firgot password link myself, and I think Jedi's issue is either a, an ad or b, malware already on the computer. Link took me to the page it should've. Now, the reason I say these 2 things is I've run inyo ads that force-redirect you. However, having malware on your computer can ALSO make weird ads pop up frequently - I ref3ntly had yo get tid of s puece of work Chromium that did the exact thing of odd ads constantly smd LOOKED like it was regular Chrome and not the malware browser.. I never had trouble with my browser before, so why now? I run one every day so that is not the problem and I just got this message before i was able to get back onto the forms. 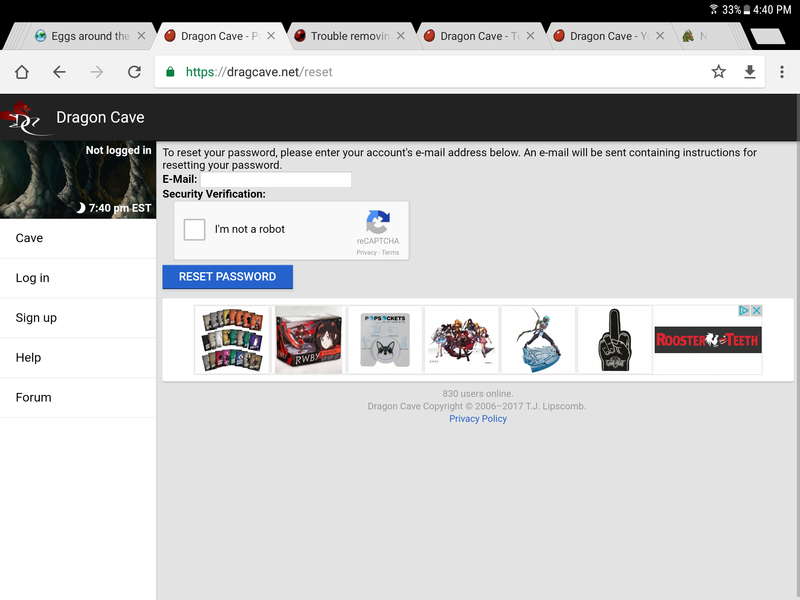 "https://forums.dragcave.net/forum/3-help/" and No I never get an email at all from DC on my new password. Yeah I get that much and when I put my email into the box it tells me to DL something I never heard of before. But were you able to successfully submit your email address and have it tell you that an email with instructions would be sent? Also, you definitely checked the "I'm not a robot" box? I just tried sending the rest email and DIDN'T get asked yo fownload anything. Besides, still possible to have JUST got Chromium recently - the way I got it was an ad secretly downloading itself to my computer. Nope I never got the email just the thing about the program I need to DL just to change my password. And I have been using Chrome for years now and never had trouble with my Scroll and password till this past weekend. But did the page TELL you that you would be receiving an email?